I have no real explanation for why we eat more junk, watch more T.V., and leave more dishes in the sink when Daddy is away, but we do. I also know he does the same thing when I’m gone. In any case, on the way home from church last night I stopped to get some natural peanut butter so I can make a batch of my very healthy Peanut Butter Power Balls (recipe to come). On a whim, I picked up a couple of packages of canned crescent rolls – well, not really a whim. I agonized (briefly) because canned crescent rolls represent all that is wrong with America’s eating habits. They are loaded with fat and preservatives and are void of nutrition. However thanks to Pinterest, I now know they are also delicious when slathered with butter, cinnamon, and brown sugar then doused with a powdered sugar icing. I mean YUMMO. 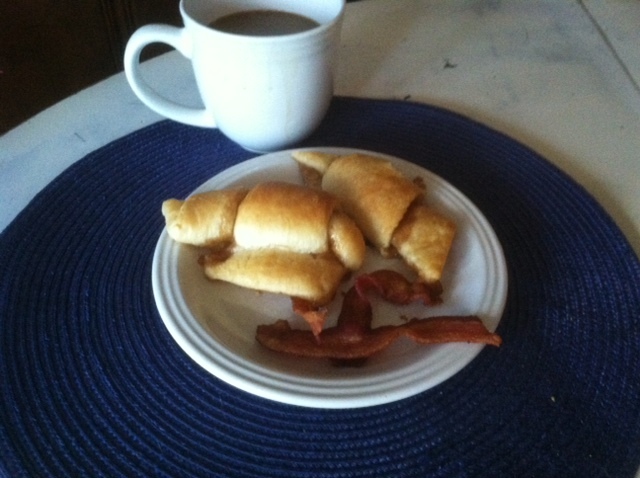 Include a side helping of bacon, and you have a breakfast fit for a Queen – a lazy, unhealthy queen. As I said, I agonized over my decision last night and again this morning. I almost made banana bread instead, but that takes time and creates a bigger mess, and I just wanted to sit with my coffee and enjoy having no place to go. In the end, my laziness won out, and the kiddos were thrilled. 1. Velveeta cheese – Maybe it’s just a southern thing. 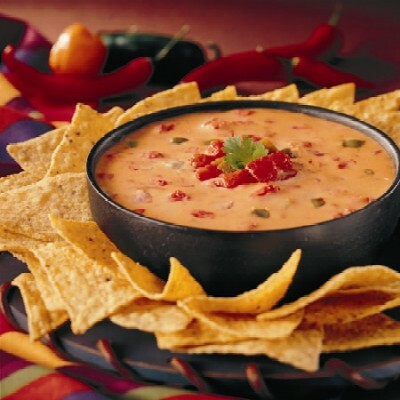 I have a friend from Canada who married into this culture, and was initially horrified by our love of Rotel dip. She, of course, has come around to our way of thinking. It is delicious. 2. Pop Tarts – Again, I’m not proud, but I love them. I’d take I couple of brown sugar cinnamon pop tarts and a cup of coffee over a fresh egg omelet any day (but I don’t). And I’m a chicken farmer. 4. Nacho Cheese Doritos – Really, yummo. 5. Coke – In fact, I hardly even count Coke as a junk food. Of course it is loaded with sugar and empty calories, but at least it’s all natural. It’s Fiengold (ten-baby-steps-to-natural-living ) approved. 6. Captain Crunch, Frosted Flakes, and several other varieties of sugar coated cereal – My mother didn’t let us have these when we were little, and I still long for them. I guess that’s an argument for all things in moderation. Maybe. 7. Frozen Pizza – Any brand – I think I can eat a whole one by myself although I’ve never tested this hypothesis. Okay, I went there. Of course I’m not suggesting that these are the only “treats” I ever indulge in, but they are the worst of the worst, the junkiest of the junky. Now I hope some of you will share your list of favorite guilty pleasures. Seriously, please share. I need to know I’m not the only healthy eater with a dark side. If it’s natural PB and dark chocolate, you’ve practically had a salad. Try again! I had a friend in high school, and when we attended cheer camps ….. we always bought cookie dough and ate it all week long! Other than that, Easter marshmellow peeps roasted like marshmellows are wonderful! The sugar coating on the outside turns into a creme brulee crust. Oh yes! Cookie dough! Good times! I will soon post my chick pea cookie dough recipe. It’s not quite as tasty as the “real” thing, but way healthier. I will definitely try the peeps idea!